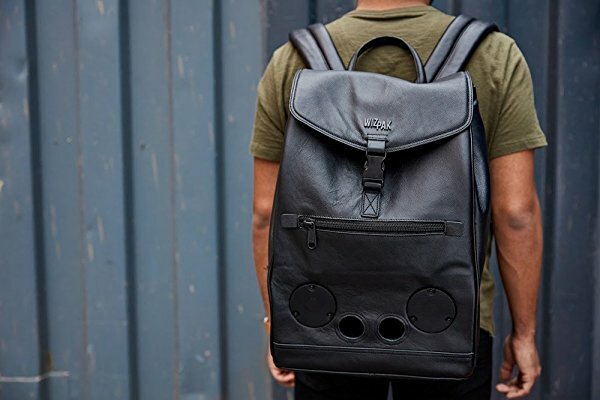 If you are tired of your plain-looking bag, and you are interested in investing in a brand new student backpack that’s made of leather, this short article should be of great help to you. Because we know that deciding what product to select is not easy, we have decided to lend you a hand by putting together a list of choices that have received positive reviews from previous buyers. These backpacks have a beautiful design, and they are overall considered a good investment by current owners, men and women alike. So, don’t waste any more time and start shopping! If you are a big fan of black backpacks, you should take the time to analyze the Solo Reade Vintage Columbian. This model has a full-grain leather body that includes a padded 15.6” laptop compartment that is very practical. This choice has a total weight of 2.3 lbs. Furthermore, this item supplies its users with numerous quick-access pockets as well as with a front zip-down organizer section. The option is also very comfortable to carry around as it comes provided with padded straps. According to the seller, this backpack is covered by a 5-year guarantee policy that might come in handy. Another unit made from high-quality Columbian leather is this alternative sold by Kenneth Cole. This choice aims at providing its user with all the features necessary in a product of this type. For instance, this model has a laptop pocket that can accommodate devices that measure up to 15.6 inches. Additionally, this pocket includes an EZ-scan feature. This means that this backpack complies with the TSA guidelines so that you won’t have to remove your laptop from your backpack every time you go through airport security. The product has a design that makes it fit most upright trolley handles for easy transportation. If you like classic looking leather backpacks, take a good look at the FRYE Men’s Logan. This choice is 100% made of leather, as it also incorporates leather lining. For easy access, this choice features zipper closures. This model sold by FRYE is very versatile as it can be used for trips and on daily commutes alike. Moreover, this product has that distinctive Frye craftsmanship signature, and it will undoubtedly catch everybody’s attention. As a plus, this alternative is quite sizeable as it measures 18 inches in height and 13 inches in width. Most of the previous buyers of the item pointed out that this choice is durable, functional and that it has a high-quality construction that is worth the investment. The Large Buckle model sold by Piel Leather is another option that you should not overlook. This model was manufactured from a durable kind of leather that is said to improve with age as it has the capacity of absorbing the oils it comes in contact with. As a result, as time goes by, it is said to get that classic, worn look that most of us are searching for. On top of that, it should be mentioned that this option is large enough to fit most tablets currently available on the market. However, this backpack does not come with padded pockets so that your devices are protected during transportation. If you need a product that is suitable for your urban lifestyle, you should not ignore the Solo Kilbourn Pebbled. This choice is highly appreciated because it was made from full-grain black pebbled leather that has brown accents and that features elegant, metal hardware that adds to its modern design. As expected, this choice comes provided with fully padded laptop compartments that you can use to carry your MacBook or any other devices that measure up to 15.6″. Additionally, this alternative has heavy twill camouflage lining. Those that have purchased the model were happy with the quality and the feel of the leather used in making it. If you have a soft spot for accessories made and sold by Adidas, you should take a good look at this next alternative. Because it was designed to be used as a laptop backpack, this option was made from water-resistant materials that are likely to last. Even more so, the model features a spacious main compartment that includes a zippered organization pocket where you can keep your valuables. Moreover, this alternative can easily fit a 15.4-inch laptop. A separate tablet sleeve that has a protective soft lining is also included in its design. Overall, this choice has received plenty of positive reviews. If you want to get an original-looking backpack, you should also consider the Piel Leather Slim Computer. Made from top grade cowhide, this genuine leather choice can accommodate most personal tablets. Therefore, you’ll be able to carry your devices with you whenever you are on the go. Just like other similar products developed by Piel, this alternative was made from a type of leather that looks better as time passes. As a result, you will still want to use this durable unit in a few years. The most appreciated feature of the model is its thin and elegant design. However, according to previous buyers, the Slim Computer is not sizeable enough for you to carry books in it. Another product that has been vetted by previous owners is the Piel Leather Checkpoint. This product stands out because it is rather sizeable. As one buyer put it, this backpack is large enough to fit a laptop, files, and personal items all at once. Moreover, because it is made from genuine leather, you should expect it to be a bit heavier than the backpacks made from different materials. Still, its weight is manageable. It has also been observed that this alternative has a beautiful and professional look that makes it a good addition to your wardrobe and a sturdy build that guarantees its durability. If you want a backpack that features numerous pockets so that you can keep your belongings organized, you should take a look at this model. The alternative comes supplied with two interior slide pockets and a zippered one, and it also has an exterior compartment that you can use to store items that you need to have easy access to, such as your phone. The product has a maximum shoulder drop of 15.5″, but you can adjust these dimensions in accordance with your needs or preferences. Also, this elegant option features polyester lining, and it was made from leather. If you like products sold by Will Leather Goods, you should necessarily give this model a go. The backpack was made from top-grain leather, and it is said to feature a patch at the top. The main compartment of the model can accommodate a 13-inch laptop. Because it was constructed from leather, this product has to be hand washed in order to avoid deteriorating it. As a plus, this option has a canvas rear lining that can help you manage moisture and heat during summer days. Plus, the included shoulder padding is a great addition as it makes the unit easy to carry around. If you’re new to the backpack trend, you probably don’t know why is there such big fuss about this type of accessory. Ideal for many situations and occasions, backpacks are cool items that provide safety and plenty of space for your belongings. A popular item among children and students, backpacks have gained a great deal of popularity due to their practicality and easy to combine features. They come in different shapes and sizes and can be worn both during the day and at night. Leather backpacks are a good investment because they are durable and look better as time goes by. Compared to the ones made from other types of fabric, backpacks that have leather in their composition add refinement to an outfit and expose your fashion skills. If you want to know how to choose an awesome leather backpack that follows the actual trend, then let an expert lend you a helping hand. Simply read these paragraphs and see what features are essential when making a backpack purchase. We’ve looked at several products for sale and made a buying guide that teaches you everything you need to know about these leather backpacks. Once you get the hang of it, you’ll never want to leave your house without wearing a stylish backpack. 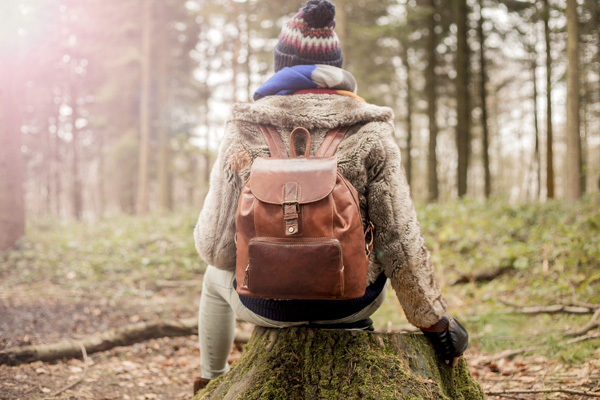 The whole purpose of having a leather backpack is to protect your valuable possessions and to ensure enough comfort for back and shoulders. An item suitable for both women and men, these can look good even no matter how much you use them and they never go out of style. Have a look at these pointers and learn how to make smart shopping choices. When searching for the best leather backpacks pay attention to the quality of the material. Not all leathers are the same, and sometimes you can even get confused because faux leather looks so similar to the original one. Cheaper models of backpacks on the market are made from top grain leather which has a finer finish because the top layer has been removed. It’s still leather and definitely durable, but it doesn’t compare to the full grain leather which is more expensive due to the softness and sophisticated look. Luxury leather backpacks are all made from full grain leather because they are more durable and look even better after years of being worn at numerous occasions. Backpacks that have this type of leather in their composition have an oil tanned surface that prolongs their durability and improves the skin’s ventilation. Lower grade leather or faux leather is usually sprayed with a special paint that makes the leather to appear full grain. Try to avoid products that don’t share information about the leather origin and type in their descriptions. These details are extremely important because they show how valuable an item is. A backpack is usually chosen by people that are active and always on the go. But that’s not necessarily a standpoint because fashion has evolved so much that people make their purchase according to what they see cool at others. Therefore, it’s important to think of a person’s gender and level of activity before making a purchase. For example, women prefer backpacks that offer the same benefits as bags and purses do. They need enough space for their personal objects but at the same, a great deal of comfort because they use it during the entire day. It should have a smaller size, though, and proper weight. Men, on the other hand, look for large leather backpacks because they carry all sorts of gadgets with them or workout gear if they plan on going to the gym after work. Leather backpacks can be worn during the day but also at night because they give that unique, stylish look to any ensemble. There are sports options if you need to wear while traveling or for weekend camping. Because they are so practical, many people prefer to invest in backpacks instead of bags because they can slip their laptop or tablet inside without too much effort. Moreover, these products distribute the weight evenly so that you don’t get back pains even if you use them for many hours throughout the day. You choose the backpack design according to your own needs and personal fashion sense. While other might like having multiple pockets and zippers other like simple backpacks that have only one compartment and a smaller one in the front. Backpacks should have a comfortable size and weight because you can’t grab them by one hand. You wear them on your back, so it is important to choose a product that protects your spine. It is preferable that you try the backpack before buying it. This way you make sure it looks great compared to your height, and the padding is enough to give you an enjoyable feeling during usage. No matter the gender, we all need pockets to place our things. Hidden ones are extremely useful because you can put your house keys, phone, and wallet without having to worry that they are in the open. If you like to change backpacks often, then invest in multiple colors. Cool leather backpacks come in a variety of colors and patterns so you can choose more and wear them with casual or sports clothing. For outdoor trips, it is recommended that you search for backpacks that have plenty compartments for water, blankets, and supplies. These items can be found in specialized stores where you also benefit from proper product counseling. Pockets are indispensable features when it comes to backpacks. Because they are so practical, most women choose them over handbags. They can keep everything inside and carry everything from makeup, money to phone and small bag perfumes. Safe pockets need proper zippers. Especially quick access pockets placed on the side or front of the backpack need have to be securely closed with a zipper that allows you to easily reach for an item. If you’re a pocket fan, try to avoid large ones that come in the front of the backpack because they add extra weight and make the item look bulkier. In the Internet era, there’s not a single smartphone addict that doesn’t know how frustrating is to have your battery phone drained. External batteries are an excellent invention because they give you a full charge while on the go. You should know that many good-looking leather backpacks are outfitted with special USB pockets where you can place these batteries and have your phone charged in complete safety.